Lokoya winemaker Chris Carpenter manages "full-on tannin"
Lokoya's Spring Mountain District Cabernet draws on fruit from Yverdon vineyard, which Jackson Family purchased in 2013. Senior editor James Molesworth is Wine Spectator's new lead taster for California Cabernet Sauvignon. He recently returned to Napa Valley for more visits with top wineries. And don't miss our Q&A with James on his Napa Cab eureka moments, his scoring philosophy, and what he's up to when he's not tasting wine. Jackson Family Wines is known for its large-volume wine brands from California and beyond, none more than Kendall-Jackson. But there's a coterie of small-production, highly focused wines beneath the company's umbrella. Winemaker Chris Carpenter handles this group, headlined by Lokoya and Cardinale and including Mt. Brave and La Jota. All four brands focus on mountain fruit. Carpenter, who stands a full 6'5" and has well-worn winemaker's hands, couldn't be better cut from central casting for the role of mountain man winemaker. Carpenter took over at Lokoya and the other brands in 2001, after apprenticing with Charles Thomas and Marco DiGiulio. Before that Carpenter worked with Antinori in Tuscany, then found himself back in California working on the Cal-Ital blends that had a boom and bust cycle in the 1990s. "Teroldego, Barbera, Tocai, Malvasia, Arneis, Sangiovese, Pinot Grigio, all being done at the Robert Pepi facility," says Carpenter as he rattles off how he cut his teeth. That facility, located right off the main highway in St. Helena is now home to Cardinale, and, along with two other wineries, handles Carpenter's cluster of wines. The mountain wines were an evolution from Cardinale itself, which from 1982 to 1994 was made from a blend of fruit culled from within the Jackson Family portfolio. Thomas, the former Opus One winemaker, was brought on in '95 to make a single dedicated wine from a specific vineyard, rather than a blend. That resulted in fruit from the Howell Mountain, Mount Veeder, Diamond Mountain and Spring Mountain AVAs being separated from the Rutherford valley floor fruit and eventually shifted to individual brands. Lokoya, which debuted in the 1995 vintage, produces four wines, one from each mountain AVA, with the wines always 100 percent Cabernet Sauvignon. Total production is about 3,500 cases annually. "Lokoya is full-on tannin," says Carpenter with his deep voice. "The wines are meant to provide the full expression of the place." "Full-on tannin" is putting it mildly. Lokoya's wines are densely structured—rigid but integrated. Consequently, they seem unyielding at first, and they age slowly. But even at an early point in their lives, the cuvées show clear differences in terroir. 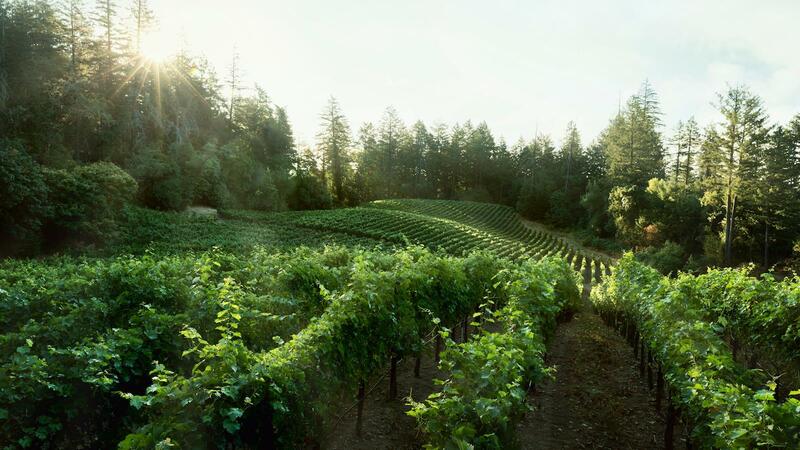 There's been a learning curve for Carpenter when it comes to managing the tannins from the four sites—Diamond Mountain District, Spring Mountain District, Howell Mountain and Mount Veeder—while letting the wines' respective terroirs shine. Key to that learning curve has been oak. "A couple of years for sure," says Carpenter of how long it took to figure out. "You don't want to mask fruit with oak. You want it to carry the fruit and add to it." "For example, Veeder is up-front fruit and then big tannins on the back, so its middle gets stretched out. I use coopers whose barrels help fill in the middle. Then Diamond Mountain is big up-front fruit and a lush middle, but it tends to drop off a bit, so you need something on the backside to get it to finish." For the four wines, the winemaking is the same, except for the selection of barrels, with the élevages lasting 20 months in a high percentage of new oak. While new oak is a bugaboo for some, it clearly serves a role, especially when dealing with red wines as muscular and in need of bottle age as these. When I ask if the slow-paced evolution is what Carpenter wants, he replies, "I do want that. I want it to hold onto its fruit as long as possible. That's the benefit of that tannin expression—its ability to hold fruit. There's a fine line between chewiness and structure, and just plain overt grip. Staying on the right side of that line is the key to making wine in the mountains." And who better to know that than a mountain man. WineSpectator.com members: Get James Molesworth’s tasting notes for all four of Lokoya's 2015 cuvées, as well as the 2007 Spring Mountain Cabernet. Follow James Molesworth on Instagram at @jmolesworth1, and on Twitter at @jmolesworth1.